Q From Nancy Shepherdson: I hope that you can help me remain on the strait and narrow. I’m a journalist who was about to write a headline containing the words strait and narrow, which I believe is the proper usage, from the Bible. However, I am fairly sure that my US readers would be more familiar with straight and narrow. Faced with the choice between being correct and being thought incorrect — or vice versa, I chose to phrase the headline an entirely different way. Am I being too much of a stickler? Or are there convincing precedents for the correctness of both? A Both have been widely used down the centuries. However, the evidence is that you would have been safe, and indeed better advised, to use straight and narrow for both your British and your US readers. 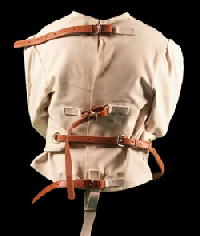 The oldest sense of strait is of something restricted or confined (it derives from Latin stringere, to bind tightly, which is the root of our constrain, strict and stringent, among others); that’s why that obsolete method of restraining lunatics called the straitjacket is correctly spelled in that way. These days we know it mainly in the sense of a narrow stretch of navigable seaway, as in the Straits of Gibraltar. Its other extant meaning refers to a situation of difficulty, distress, or need, but it usually appears only in the fixed phrases dire straits, for a situation of great need or extreme danger (a phrase known from the last decades of the nineteenth century), or straitened circumstances, for a person who is living in poverty. The Gospel writer was using narrow and strait in similar senses to reinforce each other in successive phrases, but the writers who borrowed the image and the reference conflated them into a single phrase. So strait and narrow is a tautology, which may by itself be enough reason to avoid using it. The folk-etymological confusion between straight and strait is widespread. Not only do we see references to straightjackets, to the extent that this spelling is frequently offered as an alternative in dictionaries, but it also appears in straight-laced to refer to someone with strict and unbending moral attitudes, a form which dictionaries also now allow. In the latter case, the original was certainly strait-laced, referring to stays or corsets that were tightly laced and confining, but which by the sixteenth century had already taken on the modern moralistic sense. There is a common sense image behind straight and narrow that has helped it to be accepted, since it can be said to contain the idea of a road which is direct and undeviating, the true path of virtue that leads us unswervingly to our destination without straying into byways of temptation. Straight and narrow is now by far the more common spelling, both in the UK and the US, one which is given as standard in dictionaries. Anyone who insists on strait and narrow may well be regarded as pedantic. Last modified: 12 January 2008.